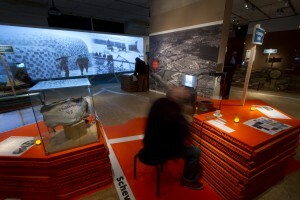 The exhibition The Hague and the Atlantic Wall. War in the city of peace can be considered as ground breaking and innovative in different ways. Firstly because of the way in which it came into being: during a process of close codesign between museum curators, exhibition designers, interaction designers and industrial designers. Secondly because it was fully constructed of low-cost materials (cardboard and chipboard). Thirdly because it used emerging Internet of Things technologies, such as Raspberry Pi and NFC, which was both inexpensive and invisible to our visitors as it was embedded in low-tech looking replicas leaving way for what really counted: real, physical encounters with digital heritage, triggering personal memory and valuable multisensory experiences. 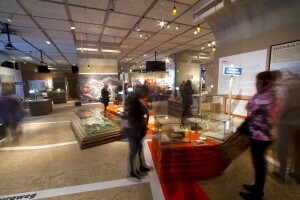 The exhibition ran from April to November 2015 at Museon in The Hague, The Netherlands. The Atlantic Wall was the German defence line along the European west coast from Norway to the Spanish border, which was erected during World War II to block an allied invasion. The topic of the exhibition was the impact of the Atlantic Wall on The Hague as the city was converted into a ‘fortress’: large parts of the city were evacuated and a broad strip throughout the city was cleared to make room for defence works. 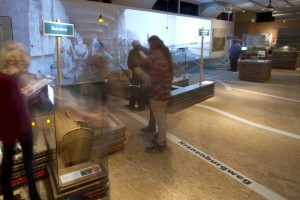 By means of Internet of Things technology, a new mode of interaction was available to visitors throughout the exhibition so as to enrich historical artefacts with personal stories. These personal stories provided different perspectives: that of the German soldiers, the Dutch civilians and the civil servants, and enriched the display of historical artefacts with voices from the past. All of the stories were available in two languages, English and Dutch. Visitors heard civilians speak about the impact of the demolition of the city of The Hague, civil servants about the dilemmas they had to face working for the Nazi occupier, and the occupying forces about their relationships with the local community. Visitors could play these narratives by using ‘smart replicas’: reproductions of real museum objects enhanced with sensors that trigger digital content in the chosen language at hotspots throughout the exhibition. Visitors could choose their favourite (smart) museum object to enrich their visit by unlocking layers of digital content in the exhibition. 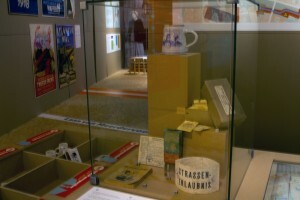 Examples of the smart objects included: a reproduction of a surrogate tea bag that gave the scent of tea, a box of surrogate sugar that had the same weight as the original; a 3D-printed replica of a Delft blue mug that had been given to German soldiers as a Christmas present and a fabric armband decorated with the same symbols as those worn by civil servants to permit them to move freely around the city. By simply placing their smart replica on hotspots on interactive cases visitors could listen to narratives and see historical photographs and video clips thus enriching the original museum objects on display. We wanted to offer visitors multiple voices on specific topics and to affect them at the emotional, cognitive, and sensory levels. We expected the smart replicas and the Internet of Things technology would engage visitors at those multiple levels. The museum building is situated in the former anti-tank ditch, in the quarter of the city where, nowadays, important international organisations working on peace, justice and safety, such as the OPCW and Europol, are established. We wanted to connect the past of WW II with the present of the city of peace and justice. In the exhibition’s concept we wanted to make explicit the relationship between the topic of the exhibition and the city of The Hague itself. Therefore the exhibition floor plan was based on the city map of The Hague and the exhibits took the shape of blocks of buildings or public spaces in the city. At the end of the visit visitors could print a personalized postcard that reflected their visit and invited them to visit the locations outside the museum that that they had visited in the exhibition and to upload personal memories to a purpose-built online map that connected the exhibition to the city.